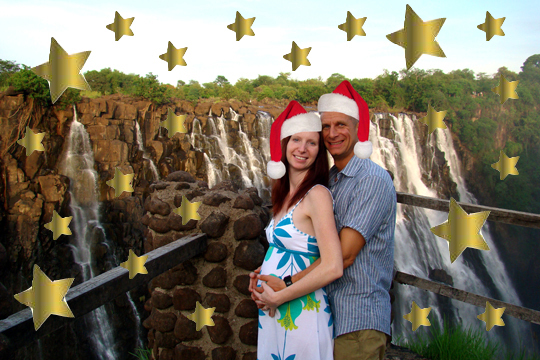 Season Greetings from Heiko & Anita in Africa 2010! We trust you are well and enjoying the holiday season. As for us, life in Africa is always changing and never the same. This year has been filled with amazing ministry, great challenges, and continued faith, holding on to our Lord for each and every day. Heiko has flown 2,485 passengers this year over the falls, sharing with them God’s majesty and divine glory. He has kept me busy with “surprise” house guests that he brings home for dinner after work so we can minister to them. I must say we have made some good friends and have been blessed to share our testimonies and faith. He has also had a engine failure in mid flight and a passenger lost his helmet as they were over the falls. To God be the glory, he managed to remain calm, hold on to faith and trust in the Lord, and by God’s miracle safely landed every time. Heiko is so passionate about flying, about ministering to his passengers and everyone he meets, and about life, I am truly blessed to be his wife. As for me, I have been the assistant to the director of Ebenezer Child Care Trust. The ministry is amazing! They have a school with 342 orphans, an orphan home with 28 children, and are just about to open the babies’ home receiving 30 babies and toddlers, there is a farm they hope to develop to large proportions. They take in the children with the worst cases of neglect, poverty, and abuse. I work in all of our areas in every capacity from counseling for the children to leading visitor tours, from photography, web design, public relations, administration, children field trips to painting murals in the new constructions, from working with the social workers in the villages to overseeing the children’s homes and numerous other duties. My days are packed full and at the end of the day I am ready to collapse…but I love it! Heiko has also been a big encouragement in the work I do with the children and that has been a real blessing for me to see him ministering and loving on the children, sharing the same passion I do. We have been really busy this year but still found a little time to sneak away and camp in the bush on the Zimbabwe side of the Zambezi river and watch the elephants stroll by, the lions roar in the distance, the giraffes quietly pass, and the immense beauty of God’s creation that momentarily swallows us up. With all the challenges of living in Africa; limited health care, malaria and other health challenges, being a minority, crazy cost of living and lack of income possibilities, and being so far away from friends and family; being held in the arms of the Father and reminded how great His love for us really is through the magnitude of our majestic surroundings makes it worth every moment. We thank you from our hearts for your continued support and prayers. You have been a huge part of our ministry and it is your faithfulness that helps us to do what God has called us to do. We pray that one day you will be able to visit us here in Zambia and we can share with you the ministry you help make happen. You are always welcome and always in our hearts. May this holiday season be filled with abundant blessings and joyous laughter for you and yours. 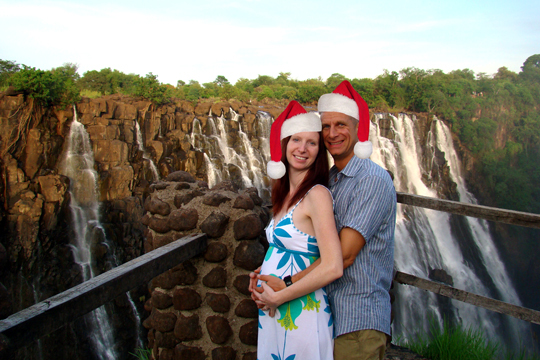 Heiko, Anita & Baby on the way!